The Greater Hartford Quilt Guild, its chapters and members, are committed to supporting our communities and charitable organizations. These are just a few of our recent contributions. Ellington Quilters donate “scent cloths”, NICU quilts, and breast cancer bags to area hospitals. A recent workshop in Pineapple Blocks also resulted in dozens of scrappy blocks which the quilters will assemble into a quilt to be donated to the Ellington Congregational Church for their November fair. The Wadsworth Atheneum Festival of Trees and Traditions has included beautiful trees donated by GHQG in 2018 and 2017, decorated with hundreds of handcrafted ornaments made our members. Our appeal for ornaments received so many responses that we chose to use just red and white ornaments on the tree in 2017, and in 2018 the blue and white ornaments crafted by our members were used to decorate a second tree. Enfield Quilters, Stafford Mill Town Quilters, and other members have recently replied to an urgent appeal from Hartford Hospital for Mastectomy pillows, delivering nearly 150 pillows to the hospital. ​Members of GHQG presented two programs at the New Britain Museum of American Art in 2015, in conjunction with the “Let Me Quilt One More Day” exhibit. One program, a children’s workshop called “Lend A Hand”, yielded blocks which were assembled into a quilt, which was donated to the Covenant to Care for Children. Enfield Quilters have already donated over 1000 pillowcases to the Shriner’s Hospital in Springfield, MA, participating in the Million Pillowcase Challenge. The pillowcases become extra-special gifts when wrapped around a small stuffed animal! 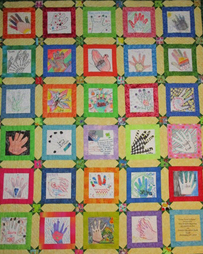 We also provide donation quilts every year to Lost Acres for distribution to victims of natural disasters, and use one meeting each year to complete some of these projects as a group. ​Heritage Quilters of Wallingford donates lap quilts every year to the Masonicare Health Care Center, pillowcases to Ryan’s Case for Smiles, and premie and layette quilts to UConn. West Hartford Quilters donate twin size quilts to the St Agnes Home. ﻿﻿Stafford Mill Town Quilters donate lap quilts and walker bags to Johnson Memorial Hospital and Evergreen Health Care Center, as well as pet mats and other projects. Recently they had a "Donation preparation" meeting at which they prepared kits for these ongoing projects, made sanitary products for the Days For Girls organization, and hemmed a quilt ready to be donated. Newington Schoolhouse Quilters donate quilts to Boys and Girls Village in Milford and the Newington Department of Human Resources, breast cancer pillows and “pretty pockets” to Middlesex Breast Cancer Center, and fidget quilts for Alzheimer’s patients. The Friendship Quilters of Winsdor regularly supply tote bags to the Harry Gray Cancer Center, and provide quilts to the Windsor Department of Social Services and to the Rocky Hill Veteran's Hospital. Recently they also participated in the Northwest Park Fair in Windsor. ​Apple Valley Quilt Guild has made mastectomy pillows for hospitals, pillow cases for Hole in the Wall Gang Camp, lap quilts and walker bags for The Summit in Southington.